As elegant and beautiful as the lady it pays tribute to, First Lady Jackie Kennedy, that is, in the immediate wake of her husband's assassination. Made it into season 2. It's so damn good, especially once the initial mythology starts to build. Dreading the mid-season 2 lull a bit, but there's greatness on the other side of it. Umm...the season 4 finale. Damn! Also, season 5 is the most compulsively watchable the series has ever been for me. Have ran straight through the first half dozen episodes. DON'T SPOIL ME! I've made it a long way knowing absolutely nothing. So close! Last week was another slow week for movie-watching. But this one seems poised to bring some greatness. Planning on getting to Martin Scorsese's Silence, which just dropped on one screen here in K-Town. Speaking of Knoxville, this week will be my first experience with my home city's own Public Cinema (www.publiccinema.org), a microcinema that sets up shop on local establishments for screenings of way under the radar indies, art films, and world cinema. Through that, I will be attending a screening of The Love Witch, which looks...crazy or awesome or both (?). I will also be continuing my quest into some of the more prominent titles I missed in 2016. I have watched 7 movies in 2017, so far. 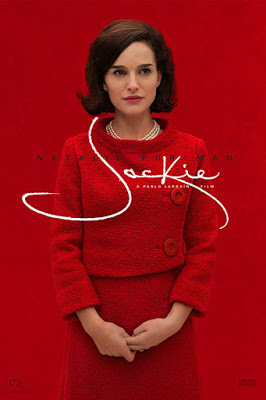 Loved Jackie. Probably one of the best performances of the year from Natalie Portman. Still haven't watched American Honey. I plan to soon. Haven't seen The Umbrellas of Cherbourg. I will soon (especially considering that I now know it's in The Criterion Collection). Haven't heard that much about The Fits. Now… on to my movie watching in the past week. On Friday, I saw Patriots Day. It was really good, & it's probably Peter Berg's 2nd-best directorial effort. (If you're wondering, his best directorial effort is his 1998 directorial debut, Very Bad Things). On Saturday, I saw La La Land for a second time. I loved it even more the second time (if that's humanly possible). On Sunday, I saw Live by Night. I liked it a lot more than most people did. Tonight, I watched the film Beginners. I thought it was amazing. This coming weekend, I plan on seeing The Founder, Silence, & 20th Century Women (which I am extremely anticipating). (On a non-film related note… on Sunday, I attended a rally at a community college in my hometown of Warren, Michigan, led by Sen. Bernie Sanders (I-VT), Sen. Gary Peters (D-MI), Sen. Debbie Stabenow (D-MI), Sen. Chuck Schumer (D-NY), Rep. Sander Levin (D-MI), Rep. Debbie Dingell (D-MI), & Rep. Brenda Lawrence (D-MI). The rally was to try to stop President-elect Donald Trump & the Republican-controlled Congress from repealing the Affordable Care Act, making cuts to Medicaid, & defunding Planned Parenthood. It was amazing to see how many people were there to support a better health care system). The Fits is a strange one, micro-budget but full of talent. I heard about it on the Filmspotting podcast, which I recommend to any movie buff. As cool a movie as Very Bad Things is, I actually think Friday Night Lights is Berg's best work. That movie is perfect. I haven't seen any of his movies since. Glad you've caught up with Beginners. It's so beautiful. I will follow Mike Mills anywhere, now patiently waiting for 20th Century Women to show up somewhere around here. Silence is on my list this week. I will definitely have to check out The Fits. I forgot Peter Berg did Friday Night Lights. I'll definitely have to watch that soon. Beginners is just... so amazing. It's the only film of Mike Mills's filmography that I had left to see before I see 20th Century Women. Surprisingly, the only theater around me that has been scheduled to show 20th Century Women (The Maple Theater, which is an absolutely beautiful art house theater) dropped it in favor of... Nocturnal Animals, which is supposedly being re-released because the Oscar nominations are coming up. Thankfully, MJR Theaters (one of the big multiplex theater chains in the Detroit area) will be showing it at 2 of their locations (one of which is closer to me than The Maple Theater), so I'm totally ok with that. Along with the aforementioned films The Founder, Silence, & 20th Century Women, I will also be seeing the French film Elle, directed by Robocop & Basic Instinct director Paul Verhoeven & starring French actress Isabelle Huppert (who just won the Golden Globe 2 weeks ago). So it's going to be a busy weekend for me at the movie theater. Um, no Kevin...you can't tease me with pictures of Umbrellas of Cherbourg and NOT even give me a rating or something. I MUST KNOW, in excruciating detail, how much you loved this movie...because you obviously loved it...I mean, how could you not? Yeah. I loved it. I'm trying something new with these posts. If you click the movie title, it will take you to my Letterboxd diary entry on the film, which contains a brief write-up and star rating. My take, in some "excruciating detail," is that Catherine Deneuve is a goddess of another world entirely and that the music in this film literally will not leave me. I have quite literally been singing my life to its tune all weekend. I love the sincerity of it, and the more bittersweet nature of it took me by surprise and really worked. It's lovely. On another note, I just this morning watched In the Mood for Love for the first time. I know you're a huge fan. I loved it as well. Notes on that one next week. Hope you're well, man. Happy to see you loved Umbrellas of Cherbourg so. I put off watching it, for far too long, first of all because usually musicals which are fully sung annoy the hell out of me, Les Miz was torturous! Even with traditional book musicals with set pieces a suspension of belief is necessary but when every phrase is set to music it is almost impossible to not come across as forced and artificial. Add into that the fact that it was in French and would therefore require reading along as a further block and I assumed it would be a chore to make it through. I was so wrong! Within the first ten minutes once I settled into its rhythms I was totally hooked and it swept me along right through to that bittersweet ending. I loved how Demy set the shifting mood through not just what was spoken but the color palettes of each scene. I was also surprised how melancholy it was but it as it went along that made complete sense. Catherine Deneuve was and is a captivating woman, of her era I’d say only Julie Christie came close to her radiance…well maybe Vanessa Redgrave. Everyone else in the film is charming but she drives it with her incandescence and without her the film wouldn’t be half of what it is. Yes! It just took me over once I settled in and let it. And yes to Deneuve...amazing! I need to see those movies, myself, especially Jackie. Watched the trailer for The Love Witch since I'd never heard of it, and nope, I'm not able to make sense of that. Like you, I think it's going to be crazy, awesome, or both. I'm hoping for both. The real shame is that I was unable, due to unforeseen circumstances to make it to that Love Witch screening. Will have to go another route. Is this the first time you are watching Lost? The show was damn good in first few seasons! Oh, no way! This is my fourth go round. I even love it after season 3 and even the finale. I'm a Lost junkie.